Commercial Drive also known as The Drive is a roadway in East Vancouver. A culturally rich and authentic neighbourhood. It runs from the south shore of Burrard Inlet south to 16th Avenue. The Drive has come a long way from when it was originally a skid road for dragging logs to the harbour. It was named “Park Drive” but renamed “Commercial Drive” in 1911. At one time there were a few speculators who wanted to build a neighbourhood similar to the West End and Shaughnessy Heights. The global economic collapse of 1913 ended their dream. During 1920s Commercial Drive was a prosperous suburb, but declined during the Great Depression and never recovered until World War II. The result was a number of historical buildings and residences were built in the area. Commercial Drive was originally closer to the centre of town—town was then located at Main and Hastings not where it is located today. Throughout the 1980s, The Drive attracted a large counter-culture demographic, including political activists, lesbians, hippies, punks, and artists. Gentrification also came to the district with new condominium housing projects and new storefronts replacing old wood-frame stores. Today the upper Drive at Broadway has turned into the city’s busiest crossroad with the second SkyTrain or Millennium Line. Today Commercial Drive is a multicultural and urban area. Commercial Drive is one of most colourful shopping, dining and nightlife districts you will find in the city. 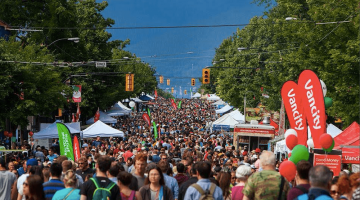 Car Free Days is held in early June, where the City blocks off Commercial Drive from Venables Street to Grandview Highway. The festival showcases local artisans, musicians, and activities. Local businesses are invited to move their production outside for the day, creating spaces for eating and shopping on the sidewalk and street outside. Home to Vancouver’s own 8 blocks Little Italy, representing more than 60 years of Italian heritage. The annual Italian Days Beginning in the early 1940s the city closes off 16 blocks to cars and tens of thousands of people celebrate with walks, dancing, and food. Large numbers of Italians immigrated to the area, street festivals were often held by the community for general celebrations of Italian culture. All day or night, The Drive offers over 300 shops and multicultural restaurants, including boutiques, live music and bar scene, dinner and dancing, theatres, coffee houses, specialty food stores, and bakeries. A mix of old-world charm meets modern hipness.